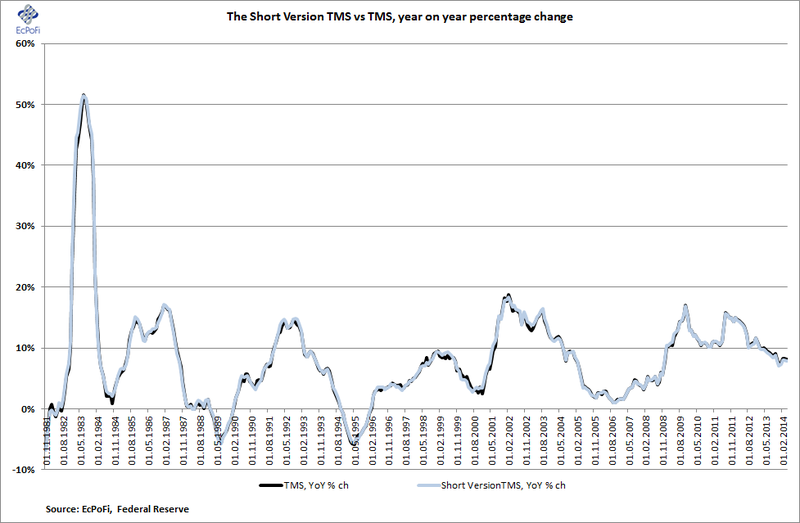 The short version of the Austrian True Money Supply (SVTMS) for the U.S. increased by 0.61% (37.29% annualised) during the most recent week ending 5 May 2014 to hit $10.0713 trillion. The money supply is calculated from the latest data published by the Federal Reserve. The 1-year growth rate in the money supply slowed to 8.01%, down from 8.18% last week. This growth rate was 1.44% point lower than the same week last year and also lower than the 52-week average. The 5-year annualised growth rate came in at 10.69% for the week, 87 basis points lower than at the same stage last year. This was the 23rd week in a row with a falling growth rate compared to last year. 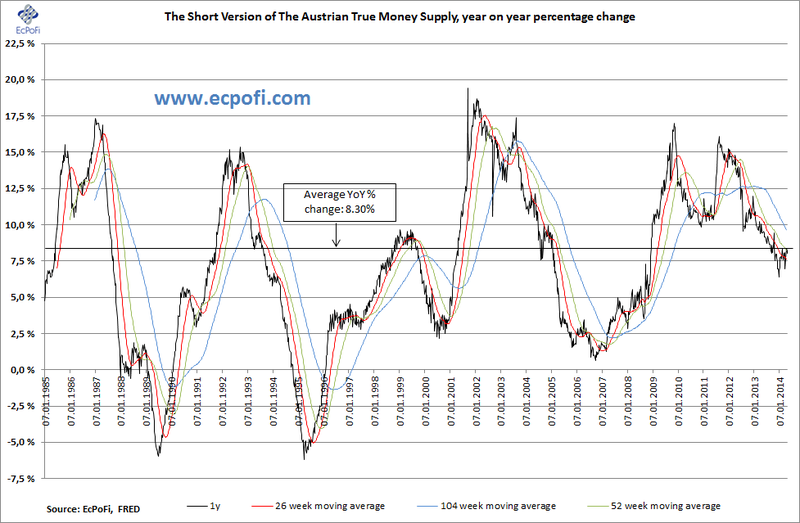 I refer to the money supply figures reported in this report as the "short version" of the Austrian True Money Supply. 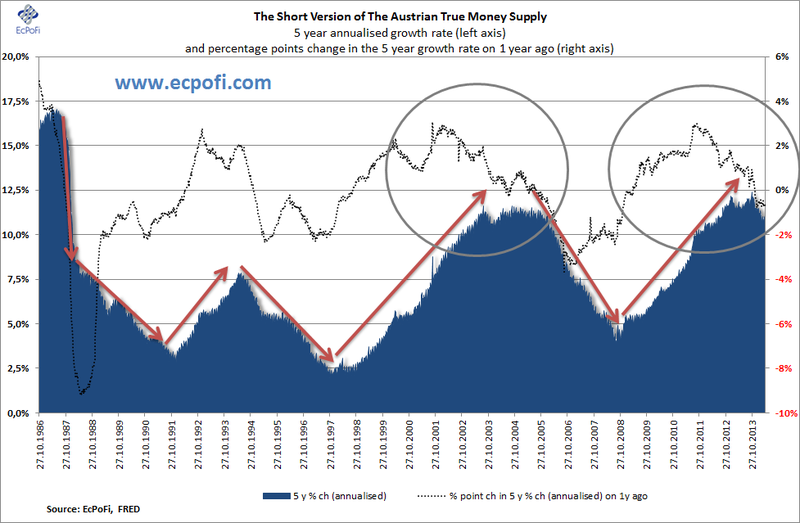 It is a short version for the simple reason that three of the components included in the true money supply (the "full version") are only reported on a monthly basis. As these items are relatively small compared to the total, the short version gives a fairly accurate picture of the development in the full version of the money supply. It also makes it possible to monitor the figures on a weekly basis (read more about this by clicking the top link in this report). Below is an update as of April, showing how similar the two series are.